Thin wall impact sockets from Apex Fastener Tools accommodate countersunk or limited clearance nut or bolt locations. Many of these impact sockets have a shouldered body design that can fit in tight quarters. Large openings on the six corners of the opening create a floating action that allows the socket to slip quickly and easily onto the nut or bolt. Ideal for compensating for imperfect alignment between the tool and fastener. Not generally recommended for impact use. These sockets are identified with a SF- prefix. 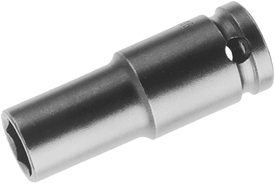 The SF-10MM45 Apex 10mm Surface Drive Thin Wall Metric Standard Socket, 1/2'' Square Drive is one of thousands of quality tooling products available from MRO Tools. Please browse Apex 1/2'' Square Drive Sockets, Metric, Surface Drive, Thin Wall, Standard Length for tools similar to the SF-10MM45 Apex 10mm Surface Drive Thin Wall Metric Standard Socket, 1/2'' Square Drive. SF-10MM45 Apex 10mm Surface Drive Thin Wall Metric Standard Socket, 1/2'' Square Drive description summary: Apex 10mm surface drive thin wall metric standard socket, 1/2'' square drive. Hex Opening: 10mm Overall Length: 38.1mm Diameter Nose End: 15.9mm Diameter Drive End: 23.8mm Opening Depth: 6.4mm Quantity discounts may be available for the SF-10MM45 Apex 10mm Surface Drive Thin Wall Metric Standard Socket, 1/2'' Square Drive. Please contact MRO Tools for details.